Beating Design Block (Level Design) – "On Game Design"
Every so often every person in a creative occupation gets stuck. It’s a common enough frustration, and one that I’ve felt the pain of on many occasions. Since I’ve been giving the problem a lot of thought, recently, I thought I’d post some techniques I use to get past it. While this may not be of immediate practical use to non-game designers, I’m fairly confident that some of the techniques can be adapted to any kind of creative process. Why do we get blocked? A lot of times, when I get blocked, I stare for long periods of time at an empty piece of paper, a new Illustrator file, or a blank Word document. I just can’t think of a single thing that I want to put down on it, and I’m completely baffled by the problem of it. Often, when this happens, I’ll find myself drifting onto other tasks. The problem is just too big, and my brain wants to somewhere it can be of more use. The task and my ability to concentrate are, at that moment, like the wrong sides of two magnets. When I get this feeling, it’s generally because the problem I’m concentrating on IS actually too large. As soon as I realize this, I have a few techniques that I use to try to break the problem down into smaller, more manageable chunks. I’m a very tactile person. I prefer to do early drafts of my designs on paper or in some physical medium. It’s important to me to be able to move things around physically, or to be able to step back and look at what I’ve done in it’s entirety. Later drafts which require less sweeping change tend to go on the computer, but the early stages have to be physical somehow. If you’re like me in this, you’ll probably respond well to the Post-It technique. I bust out three or four Post-It Note pads (each a different color) and three or four colored markers. Then I proceed to write down everything I can think of about my level: What kind of locations would be fun to see in this level? What kinds of enemies or encounters can I include? Sometimes I even get as granular as specific landmarks or structures that might appear only in one place in the level. Each of these gets its own post-it and goes up on the wall in no particular order. I color-code them based on whatever seems to make the most sense to me at the time — making no attempt to rationally organize or disrupt the flow of ideas. When that runs dry, I stand back and look at the wall and start weeding out the weak or redundant ideas. These all go on a separate part of the wall in case I need them later (never, ever, throw anything away!) and I begin to sort the remaining ones into categories. Where might these appear in the level? Do any of them share a common theme? Then, when I finally get them all sorted out, I put them in order. Which of these things would be good at the beginning? Which would be good at the end? For enemies and encounters, I begin to think about difficulty ramping and other design principles and arrange them appropriately. When I’ve got this all done, I take a picture of it with my digital camera (in case a post-it falls down) and then transcribe the whole thing into Excel or Word. By the time I’ve done all this, I have a plethora of ideas and I can finally begin to start drawing a map. There are some cases where the Post-It approach is not appropriate. What if you’re the type of person who thinks better on the computer? What if you need to show the results of this to someone else who can’t understand your stupid made-up organization and encoded cryptic phrases? What if you hate wasting paper? What if you own stock in a competing paper company? In these cases, a bubble diagram comes in very handy. A bubble diagram is a VERY simple map of the level with arrows indicating travel direction and circles indicating destinations. Next to the arrows you put text that describes what you do to get from one destination to the next. Or rather, that’s how I do it. Almost every designer I know does them a little differently, and that’s okay! The only requirements are that you must be consistent and that the final product must be readable. Part of the idea with these things is that they can help communicate your ideas to others, so keep that in mind when you do them. 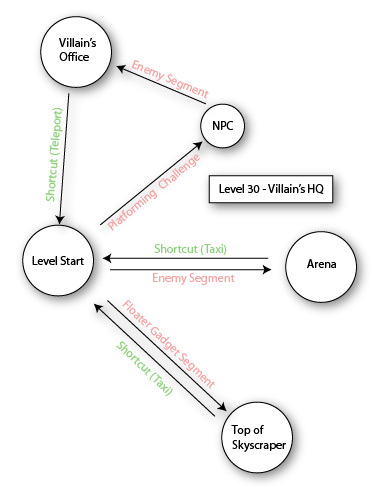 This is an example of a bubble diagram of a level for a Ratchet and Clank – type game. It’s pretty self-explanatory: Put all your major goals, destinations, landmarks, or environments in circles and then draw lines between them with arrows. You can interrupt the lines as much as you want with other circles to expand your idea. Keep doing this until you have enough to start actually designing the level, or until you have enough information to accurately describe your level idea to a third party. Bingo! The block is gone! I tend to be very technical with my designs. I often start by developing a formula for the level — something very linear, very symmetrical… and very boring. This often takes the form of a checklist or bulleted list of features that the level HAS to have. You’ll notice that the list is very concrete, even , and linear. It also looks very boring. There’s nothing even remotely creative about this — it’s just a feature list. It’s like reading the back of a game box, only less interesting in every conceivable way. It makes the right brain SCREAM in outrage… and that’s exactly why it’s awesome! The problem started because the creative part of the brain wouldn’t get started. So to retaliate, we cut that part of the brain completely out of the loop. By the time we get back around to customizing our boring formulaic outline, the right brain is SO angry that it begins to work overtime. The list then becomes less of a checklist and more of a skeleton — a frame around which we can begin to sculpt something that actually IS cool. It’s both a starting point for the process AND a catalyst to stir the brain into action. What I’m trying to say is that it works pretty damn well most of the time. Anyway, that’s all I’ve got on the subject for now, but I’d love to hear what methods you guys use to get past your creative blocks. Feel free to post whatever you’ve got in the comments. Tagged Ratchet, reading, SCREAM, SO, work. I usually get stuck when trying to approach a specific area or problem within a project. Maybe it’s a level layout. I know what sort of environment the level is (building interiors give me the most trouble), but the layout is making me tear my hair out. If that’s the case I usually focus on some other detail. Preferably something related, like the villain of the area or the rewards found within, but it can be totally separate as long as it’s interesting. I flesh out the other detail for a while. When I’m done I’ve either come up with something tangential to inform my original problem, or my brain’s shaken loose enough to get over my creative block. Still, next time I think I’ll try some of your strategies. They sound good, and I can always use another way to get over the creative hump. I know what you mean — moving onto another problem sometimes makes the one your’e stuck on go away easier.